When I drop off my children at my local elementary school in California there is a huge mural that says: “Everyone Here Can Play.” Classrooms have “bully-free zone” signs. This is a far cry from the playgrounds of my youth, where bullies ruled, and inclusion was guaranteed only if you were part of the “in” crowd. If only the emerging debate on clean energy policy was as inclusive. Why do I say that? Because the Green New Deal, an effort aimed at rapidly decarbonizing our economy to stave off climate catastrophe is unlikely to succeed if nuclear energy, America’s largest source of zero-carbon electricity, is unfairly excluded. It is equally clear we need to make drastic changes to our energy supply, and we need bipartisan support to do so. By tapping the power and ingenuity of our diverse society to pull together for effective CO2 reduction measures, we could decarbonize in the urgent timeframe our planet needs. Despite the division and rhetoric around us, we need everyone here to play together. When it comes to low-carbon energy sources, everyone seems to have a favorite technology. Over 600 groups penned a letter to Congress to tell them which of our available carbon cutting measures should be “in” and which should be “out.” Purposely excluded was nuclear energy, our best hope for rapid action on climate change. The February 7, 2019 resolution introduced by Representative Alexandria Ocasio Cortez and Senator Ed Markey uses technology-inclusive language like “clean, renewable, and zero-emission energy sources,” but this inclusivity may only be skin deep as a fact sheet distributed by Ocasio-Cortez’s office calls for a transition away from nuclear. We hear the restrictive renewables-only mantra coming from many of those raising the alarm on climate and pleading us to “stand with science”, but the technology-exclusive rallying cry is in direct conflict with the diverse clean energy mix leading climate scientists tell us is needed to achieve the carbon reductions we need. My ears hurt from the sound of the irony. Sidelining nuclear has real consequences for our climate: After several U.S. nuclear plants closed early, most of their emission-free electricity was replaced by power from gas-fired plants, and emissions went up. Now we see 12 more reactors in the US that may close early, which together produce as much power as all the homes in California consume. Franklin D. Roosevelt launched the original New Deal in a time of gender inequality, Jim Crow, and widespread discrimination. In the 1930s everyone was not welcome on the playground. Despite that social landscape, the New Deal pulled our country together with a “can-do” call to action, enabling us to tap the power of our differences. The broader scope of the New Deal was a diverse portfolio of policies and changes that hoisted the country out of the Great Depression and injected hope when millions were gripped by despair. When we work together, we can achieve what once seemed impossible. We have come a long way since the 1930s, but the partisan politics of today have people picking sides, lining up as “us” vs “them.” The only thing we can agree on is that we don’t agree. More than just low carbon, a diverse energy mix has broad appeal no matter your politics — we can lower costs, increase reliability, conserve land and natural resources, and boost our economy along the way. We need nuclear. We need renewables. We need everything else in between — and we need to get out of our corners and work across the aisle to get there. If the Green New Deal is to succeed, it will depend on our coming together to transcend our divisions and move our energy policy to a truly inclusive state. The playground of our future should be one where all low-carbon energy sources can bring their best game. It was with a skeptical attitude that I first started my job at Diablo Canyon. I’m generally trusting of people until they prove themselves unworthy; but with technology, it’s the other way around - I’m initially skeptical and trust must be earned. My skepticism manifested itself in relentless questions, as I am generally curious and love to learn from people and conversations. First, I tried to understand everything about how the plant works, what’s the deal with the waste, and what happens in abnormal situations. My colleagues in initial operator training were often annoyed with my questions in class – “but what about this?” and “how does that work?” – especially on Friday afternoon at 4:30pm. After I understood plant operations, I moved on to questions about every possible thing that could go wrong, and the consequences. I won’t say all those questions were easy to answer – it took me many years. But I was eventually satisfied that by helping the plant to run efficiently, I was in agreement with both my environmental and humanitarian values. Not only does nuclear have relatively small impacts on nature, it also provides an enormous amount of emission-free electricity. My questioning attitude hasn’t stopped - I am constantly reevaluating the benefits and risks of nuclear. When I uncover information that challenges my position on nuclear energy, I start the questioning process all over again - equally ready to change my mind or to reaffirm my support. When life-altering experiences occur, we tend to remember exactly where we were, and what we were doing. In a very similar way to 9/11 (I was about to get on a plane to fly to New York), I remember the events now referred to as 3/11. On March 11, 2011, I was called early in the morning to come into work. I was told that Avila Beach, which was on the route to Diablo Canyon, would soon have restricted access. Upon arriving in the Control Room at Diablo Canyon, I learned that there had been a large earthquake in Japan (1), and there was a tsunami watch for our area of California. As Operators in the Control Room, my coworkers and I took extra precautions. We reviewed our abnormal operating procedures to ensure we were familiar with any range of scenarios. We stood at attention through the multiple hours when it was predicted that tsunami waves would arrive on the Pacific coast. We watched for abnormal conditions that would affect our ability to provide cooling water from the ocean to the plant. We knew if there was a significant drawdown, we would need to take some temporary actions until the ocean returned to normal. That day turned out to be uneventful at Diablo Canyon, but over the next few days, my convictions about nuclear energy were turned upside down. There were various stories about what was happening at some nuclear power plants in Japan. The rumors sounded bad - almost unbelievable. At first I felt dismissive of the idea that anything significant could be happening there. After all, I had spent all these years developing and affirming my support for nuclear technology. But then, I saw the video. Someone turned on the news, and I saw replay after replay of one of the reactor buildings at Fukushima Dai-ichi exploding. My heart instantly filled with fear – fear of what it would be like to be a Control Room Operator there, fear of what it would be like to be wondering if coworkers had been hurt or killed, and fear that I didn’t understand why this was happening. It seemed like no one had reliable information. 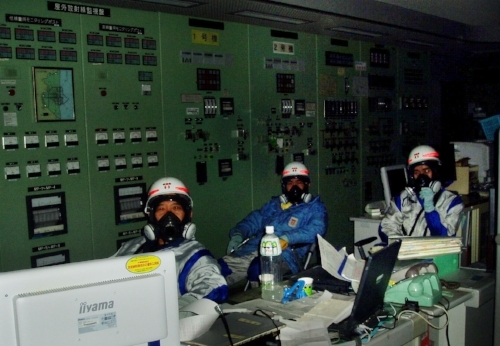 Operators at Fukushima Dai-ichi in a completely dark control room. It was a while before accurate information was available, and unfortunately it did not reduce the presence or popularity of fear-inducing propaganda. Some media and advocacy groups had a heyday making up the worst-imaginable scenarios. One particular example that stands out in my mind was the graphic that anti-nuclear activists were (and still are) calling a “map of radiation” spreading outward from Fukushima. This graphic is actually a National Oceanic and Atmospheric Administration (NOAA) representation of the tsunami wave height. A similar map from January 23, 2018. In addition to the “radiation” map above, there is still a wide range of misinformation available on the internet. Google image searches for 'Fukushima' return lots of scary things, including pictures of burning natural gas plants and oil refineries. As I learned more about the details of both short- and long-term impacts of the accident, it became clear that our fears were largely misdirected. Even in this horrific-sounding scenario, the human health impacts resulting from the accident were caused by the evacuation, and not by radiation or by any events at the plant itself. (2, 5) The situation at Fukushima Dai-ichi was stable, and international teams were joining together to develop innovative new solutions to the challenges at the site. A lot has changed since 2011. Kristin and I started Mothers for Nuclear in April 2016 because we realized that nuclear plants were shutting down early around the country and being replaced primarily with fossil fuels. We also realized that many of the challenges faced by nuclear energy are a result of misperceptions, including those surrounding the events at Fukushima. Art by Aileen Abd, Mother for Nuclear. We get a lot of questions about Fukushima, and even after learning more of the technical aspects of the plant and the recovery activities, it still felt like something was missing. On Feb 4, 2018, I was able to see the site for myself and evaluate the issue from a new perspective. 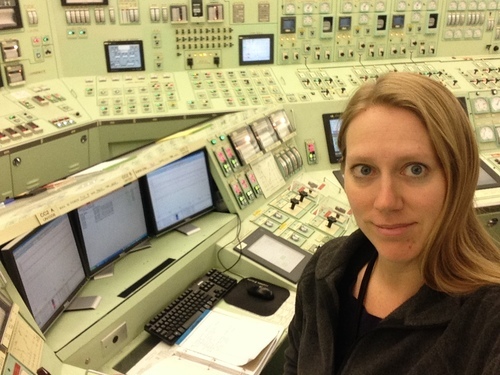 When I visited Fukushima Dai-ichi, I felt an emotional reaction similar to the one I felt seven years ago in the control room of Diablo Canyon – fear, disbelief, empathy, and sorrow. It’s hard to fathom something powerful enough to cause such damage to concrete and steel, and in this setting it’s even harder to separate emotions from facts and reason. Sometimes the hardest things to think about are also among the most important - a technology that produces large amounts of emission-free energy on a relatively tiny land footprint addresses our biggest environmental and humanitarian challenges, and it’s something that deserves open minds and honest evaluation. As we drove through the evacuation zone, I saw empty towns - abandoned after the earthquake and tsunami and now frozen in time due to hurried evacuations. Although the levels of radioactivity in the area are low, these towns now face a difficult question - to rebuild or not to rebuild? (8) Towns require infrastructure - water, electricity, schools, grocery stores. Radioactivity is no longer the issue here; the deferred rebuilding effort and the current lack of infrastructure prevents residents from returning home. When we reached the Fukushima Dai-ichi site, I saw contrast after contrast. New office buildings next to damaged structures. Intact reactor buildings next to the twisted metal and crushed concrete of Units 1, 3 and 4. Beautiful forests and cherry trees next to wide expanses of asphalt and concrete. Abandoned and rusting bolted steel tanks next to new welded tanks, waiting to hold water that has been cleaned of all contaminants except tritium. A calm ocean next to tsunami-damaged tanks and roads. Thinking of the forces that caused this damage is scary, and it’s not something anyone ever wants to be repeated. While it is tempting to change my position based on emotion alone, but the truth of this situation, when I purposefully put aside my emotions, is that everything must be considered in context. Lots of industrial sites are huge. 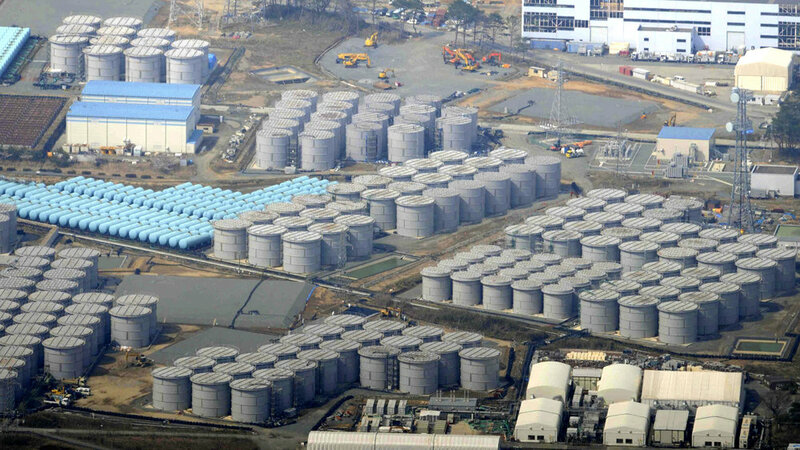 Lots of them have concrete and tanks. Accidents happen at other places, and with much greater frequency and much more impact to human health (e.g. natural gas plants and oil refineries such as those shown above). Lots of disasters kill lots of people. Also, lots of people die in ridiculous, careless ways, and for unjustified activities (e.g. the Darwin awards). These maps show the two sites in comparison, on the same scale. Industrial accidents happen A LOT and cause widespread damage and destruction. We often don't even pay attention to news stories about pipeline explosions or oil spills – they are too common. Commercial nuclear power, on the other hand, has only had three significant accidents. Everyone knows about these three - because there are only three. Providing large quantities of emission-free electricity with very little environmental impact is an activity that justifies a certain amount of risk - it is worth the cost. We don’t have to be emotionless robots to accept nuclear energy or accept the fallout (no pun intended) from Fukushima. This was hard for a lot of people, for lots of different reasons. It’s also okay to feel bad about the consequences, and to improve our processes to be even better. If we look at the positive and negative sides of all the different energy sources, it becomes clear that there are risks and trade-offs involved in everything. Knee-jerk reactions to major events can cause worse outcomes for everyone in the end. There is a lot to learn about the accident at Fukushima, and I have gained a wealth of technical knowledge about the event through my training as a reactor operator. However, technical solutions alone are not enough to solve the problems that remain. After visiting Japan and seeing Fukushima Dai-ichi for myself, I am better able to see the bigger picture. As Japanese citizens in Tokyo and other major metropolitan areas breathe toxic air due to fossil fuel emissions, fear of nuclear power and low public opinion hamper the country's ability to re-start what was once their largest source of clean energy. Emotion can prevent us from solving this problem, or it can shift to help propel Japan and the rest of our world into support for a clean energy mix. This won't happen by itself, people must be willing to challenge their mental models and question their opinions. Emotion can be powerful, but knowledge combined with emotion has the power to change our world. David Middlecamp (2018). San Luis Obispo Tank Farm Fire. SLO Tribune. Retrieved from: http://sloblogs.thetribunenews.com/slovault/2010/01/san-luis-obispo-tank-farm-fire. Ever since Heather and I launched Mothers for Nuclear on Earth Day, 2016, we have fielded a steady barrage of anti-nuclear sentiment from people who are not convinced about the merits of nuclear energy. One consistent taunt we hear is “go to Japan, go to Fukushima, then you’ll see that nuclear energy is not the clean energy solution you say it is.” So, on one chilly day in February of 2018, we accepted the challenge. The timing could have been better. Besides the winter cold, I am six months pregnant and girding myself for the inevitable accusations that I am an irresponsible mother. Piles of research papers fill the backpack at my feet telling me that my choice is safe, but data alone does not explain the pull that I feel to see firsthand what happens when nuclear energy goes wrong. Looking at the history of nuclear technology, there may be no more difficult place to be a nuclear energy advocate than Japan. The first atomic bomb was dropped on the Japanese city of Hiroshima on August 6, 1945, a city with strategic military importance and a population of approximately 350,000. The first bomb was followed by a second, only three days later, dropped on the city of Nagasaki. The debate about the ethics of the bombings continues to this day, but the horrors of the atomic weapon are indisputable. It is easier for us now in the 21st century to think about the atomic bomb in a more philosophical way. For many alive today, the detonation of an atomic bomb is a thing we talk about and hypothesize about but not something we’ve lived through. It is more difficult to approach this topic with empathy if we do not try to understand what happened, to feel the impact, to let the emotion penetrate our souls. I consider myself to be an empathetic person, but as such I can often find it emotionally unbearable to let myself constantly feel the wide range of emotions that comes with attempting to understand the experiences of others. We would all be emotional disasters if we didn’t put up some barriers. But as it goes with emotional barriers, it’s hard to know you’re using them until they are challenged and something that you didn’t realize was there at all cracks and lets emotion flood through. On vacation with my family this summer, the questions from the backseat changed from "are we there yet?" to "mom, is that a dirty energy power plant, or a clean energy power plant?" It is amazing to observe how energy shapes our landscapes, and even more amazing to pair these observations with thoughts on human health, climate change, and the global energy outlook. Read more about one enlightening energy road trip in this story we posted on Medium. The answer is, "no, we're not there yet." Should I buy organic or conventional produce? Is it my turn to drive the carpool? Did the kids brush their teeth this morning? Do I have time for coffee before my next meeting? Should I get solar panels on my house? And nuclear power -- that sounds scary. Didn’t I just see something about that on my news feed? Moms are busy, I get it. Each day we must make hundreds of decisions that affect ourselves and our families. In our fast-paced and information-hungry world, we sometimes feel forced into making snap decisions. All too often these decisions are based on headlines, memes, or 30-second video clips. We have an overload of information, and a shortage of time to sort through it. When it comes to nuclear energy, few topics are more likely to be misunderstood. When anything involving the word “nuclear” becomes newsworthy, conflicting stories fill our newsfeeds. It becomes nearly impossible to differentiate the facts from the fear. That is one of the reasons why Heather Matteson and I founded Mothers For Nuclear – because we saw a gaping divide between the facts about nuclear energy and the story that many people believe. I have read plenty of these sensational anti-nuclear articles, and I have the same thought each time a new one pops up: STOP IT. Stop preying on us.